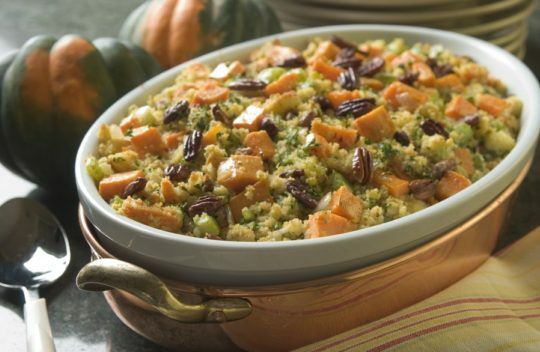 Naturally sweet yams and cornbread team up for a mouthwatering savory stuffing. For a time efficient approach, prepare the cornbread and toast the pecans a day ahead. This recipe is from Holly Clegg’s trim&TERRIFIC Gulf Coast Favorites. In large skillet, cook sweet potatoes, onion, celery in butter over medium-high heat 7-10 minutes, or until just tender. Spoon mixture into large mixing bowl. Stir in parsley and ginger. Add corn bread and pecans, toss gently to coat. Add enough broth to moisten. Place stuffing in 2-quart oblong casserole. Bake, uncovered, 45 minutes, or until heated through. Serve. Terrific Tidbit: For a time-efficient approach, prepare the cornbread and toast the pecans a day ahead. Sweet potatoes are packed with vitamins and enhance the nutritional value of this recipe.